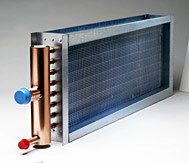 There are several things to consider when replacing HVAC coils. The first of which is, why did the coil fail? As with any replacement component, the technician should consider why this component failed. If it was because of age, the component reaching its full service life, there may not be anything else to consider. But then again, by upgrading the coil, the owner may be able to increase the serviceability of the unit. The same consideration may apply to early failure. If there was early failure because of a related component in the system, for example freeze protection failure, then that process should be addressed. However, if the original design is just not sturdy enough for the application, an upgrade may be in order. There are several things to consider in the design of HVAC coils. In terms of upgrading coils, the primary concern is typically materials of construction. For example, corrosive environments can wreak havoc on coils. Depending on the conditions, there are several possibilities for coil construction. The most common arrangement is copper tubes with aluminum fins. However, it is possible to have aluminum with aluminum; copper with copper; steel with aluminum; steel with steel; stainless steel; and baked phenolic coatings. Another thing to consider is the thickness of the tubes, the thickness of the fins, and the spacing between the fins. The designer must keep in mind that varying the material and the thickness of the material will change the heat transfer rate. RJ Owen Associates offers a full range of HVAC and Industrial Process coils. We can design for the specific job, offer upgraded replacement coils in various configurations, and help with the design of new coils. Contact us today for all your coil needs.